How did you go about preparing your stories for sale, after NaNoWriMo ended? Did you do any tweaking of the text, show it to friends, read it aloud? EK: Mostly I obeyed that suggestion to leave the text alone for at least a month, to step away from it. Afterward, I tweaked the text as best as I could, and sent it out to a friend to double-check and beta-read. Kuyerjudd: I’ll be honest: I didn’t finish the novel by the time NaNo ended. Of course, when I found out about the Komikon, I worked hard to finish it, with my best friend handling editing duties. Pauline: Totally–a lot tweaking. I edited half of the first part of the story so it could match the ending better, and as I edited, I read it aloud to make sure it sounded plausible and sensible. Though a lot of my friends asked to see it, I don’t think I’m quite ready yet to show it to anyone outside my literary circle, at least not until it’s finally out as a self-published title. What made you choose distribution through CDs, and through a booth a Komikon? What file format is your ebook going to be in? Kuyerjudd: I read an article about the impending rise of the Era of E-books, and thought I should give it a shot. I’m more of a paperback person, but what the heck, right? Pauline: Actually, I was offered the chance to be EK’s partner in this project, and then we thought of extending it to fellow PinoyWrimos as well so more people could be involved. File format will be in PDF to ensure protection and so that reading won’t be limited to just the computer–people can upload it into their iTouch/iPhone/iPad or PDAs or any ebook readers that supports PDF. EK: Practically speaking, it is easier and cheaper to create and distribute a 150-page story through a CD. This also allows us to provide artwork, or to even consider adding music files. Komikon is primarily an event for independent comics, so I figured it would be a feasible venue for independent fiction as well. Also, the people who will be at Komikon will likely be young people acquainted with the works that influenced the authors (both eastern and western comics and speculative fiction), so I was hoping they would be a better market. Raven: Having a booth in a Komikon will get us a chance to show people what we can do, and how far we’re able to take it. I, for one, also want to erase the concept that writers stay indoors in their “own little world.” Believe or not, we talk to people–not just because we have novels for sale, but because we want to share our stories with you. Getting more people to read my work is important, and having it on CD as a PDF file is the best way to achieve that. Can you tell me a bit about the involvement of Ria Lu and Talecraft? Pauline: Well, I’ve been using Talecraft since I was in high school to keep my brain churning, especially during Slump Season. Raven: Talecraft is a story telling game that really suits our needs. What happens is that you need to create a story based on the cards that you pick, and it helps us learn which elements we can use to create a good story, and which ones we have to set aside, or mix with other elements–otherwise we lose the story, we lose ourselves. As for the Komikon booth, Ria Lu is taking a risk with us, and we don’t want to let her down. Kuyerjudd: Ms. Lu and Talecraft have generously offered to sponsor a booth for us WriMos. I truly do believe in their Project 20:10 advocacy. Writing is all about taking chances: you don’t always know if you’ll get published or not, but all the same a writer has to keep writing. We hope other people will give our stories a chance as well. EK: Talecraft has been a friend of the Pinoywrimos for several years. Since Komikasi initiated Project 20:10, I contacted Ria Lu in the hope she would be interested in supporting the Pinoywrimos as Pinoy authors, and that she would remember me well enough from previous meetings. I was afraid of doing this completely by myself, because I am not a business-savvy person, so I am very grateful for the support of Ria Lu and Komikasi. 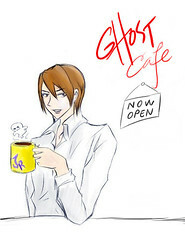 (To Pauline) Tell me a little bit about Ghost Café: Now Open? Is that the title of both the novel and the short story, or just the novel? Ghost Café: Now Open is basically the first part of an anthology that I’m working on right now, about the life of people from the ‘otherworld’, or the paranormal, who live in the normal world. The first part, the short story, is about how Jeremy Reiner, the protagonist, returns to being an exorcist after four years of retirement. The second one, the novel, introduces the readers to the kind of job Jeremy really has. GC: Now Open is the title of both the novel and the short story–it’s like a bundle or a package name. (To Pauline) Why did you choose to make your protagonist a retired exorcist? It may sound a little cliché and a bit theatrical, but the idea comes from the concept of rebirth. 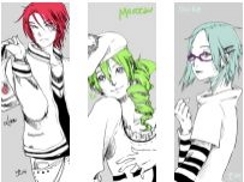 It’s a rebirth for me, the writer, and the protagonist of my story as well. I wanted to show my version of how someone who has fallen from grace but who can still redeem himself–not to other people but rather in his own eyes. Choosing a protagonist like this is like going on a long journey of experiencing new things, re-experiencing the past, and at the same time, making peace with unresolved inner issues. (To Raven) Tell me a little bit about Crimson Skies. The blurb on the Talecraft site labels it as “literary fiction” but goes on to mention angels and perhaps a transference between worlds. At first I opted to label Crimson Skies as simply “fiction,” but then came a question: “What kind of fiction?“ Since Literary fiction is “not precisely defined”, Crimson Skies ended up falling under the same, but I hope to put an exact genre on it in the next volume. (To Raven) What kind of world does the story take place in? 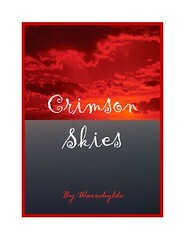 If you can imagine yourself trapped in a world where forgiveness isn’t handed out easily, where the creator you were taught was merciful is anything but that, that’s where Crimson Skies takes place. In such a world, how can one keep his faith? Crimson Skies is about dealing with questions that have bothered me as since I was a child. 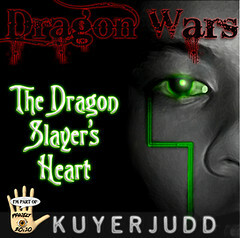 (To Kuyerjudd) Tell me a little about Dragon Wars: The Dragon Slayer’s Heart? That’s the title of the novel I take it… so what’s the excerpt from? Is this meant to be the first in a series? My protagonist, Anthony Archer is the perfect student—honor roll, president of multiple organizations, well-rounded—but he gets caught up in the world of gaming and he starts becoming attached to it. Suddenly, he hears his avatar talking, and it reaches the point where he actually sees and feels the avatar. He loses himself to it. In the story, I’ve tried to weave in the inequities of today’s society, so that more people will be able to relate with my protagonist and the story itself. (To Kuyerjudd) The protagonist of the story is a gamer, and much of it seems to take place in a game world made real. Are you a gamer yourself? Did this influence how you approached the story? Ooh, ooh! I like talking about this. I never start writing a story until I know what it will be about and until I know who my characters are–and, for NaNo, I sort of cheated, as the characters I used were characters I knew firsthand, taking pieces and traits of people I knew and putting them together to form an entirely different character, especially since I also put a little of myself in every character I write. And no, I’m not a gamer (although I am a writer who easily gives in to procrastination—FarmVille or Tiki Resort, anyone?) but I had to do the leg work to create my characters. I hung out with some of my classmates who play DoTA and used that to my advantage as a writer. I wanted to find out what happens in the mind of a person addicted to gaming. (To EK) Tell me a little bit about Activated. It’s labeled as a young adult story… did you initially set out with that target audience in mind, or was that simply how the story evolved? ‘Activated’ as a concept was originally born as a possible submission to The Farthest Shore. Unfortunately the concept refused to settle quickly in my brain, and the story began to demand space for its characters, and it refused to be a short story, or even a novella. Finally it became the Nanowrimo project. The story is about a group of young people, all skilled programmers—that is, element and attribute spell-casters—brought together and forced to help each other, in order to protect their home. I’ve been submitting to online and offline markets just enough to know that my natural writing style results in pieces too long for children’s fiction and too simple for adult fiction Since my style seems better suited for young adult fiction, I might as well be true to myself and go on with it, and let the characters be the young people that they are. (To EK) You’re a published short story author. How different is the experience, between working with an editor on a short story, and completing a novel on your own? I am grateful to the people who have published my work (one of them being yourself), thank you. I’m not sure they could be compared. Definitely a novel is a much longer story to edit, and needs to be checked for narrative continuity besides grammar mistakes and narrative development. But editing is still editing, something needed by any story of any length. Because the novel form is longer, large swathes of text gets taken out, rather painfully. Truth be told, this is not my first time making a novel-length story. However this is the first time I wrote an original novel-length story in a straight line. I appreciated the elbowroom given by the novel form. I liked getting to know the characters better along the way, and watching side stories develop in the process. (To everyone) In your own words, why should readers pick up your books at this weekend’s Komikon? Pauline: Part of me wants people to see that self-published writers are not really that different from established writers. But honestly, I just want to share and let people have a glimpse of what’s been stuck inside my brain for eons. It’s like a one-sided conversation, perfect for anyone who ends up falling asleep while someone’s pouring out his drama over the phone. Raven: It’s a major challenge for me, as a newbie to do this. I keep asking myself: “Am I really doing this? !” But I am, because I want readers to fall into a world where people are questioning not just what is going on around them, but their very own existence. I would like to take the readers in a different reality. Kuyerjudd: I think my story is easy to relate to, in a lot of aspects. I do believe readers should take a chance on it because we should all take chances on literature—the writer, the publisher, and as I see it, even the reader. Each book you read—or each novel you write, each manuscript you take a look at—tells you something about a person, about an era, about a country… and it tells something about you as well. EK: There are no local equivalents for these stories, not yet. We are hoping readers will like what we have to offer and want more of it. Please give us a chance, tell us how we can improve, and support our humble efforts. this is my first time to know about NanoWriMO. and your post/ interview help me to visualize the whole concept. glad that writers nowadays are young, innovative and persuasive.